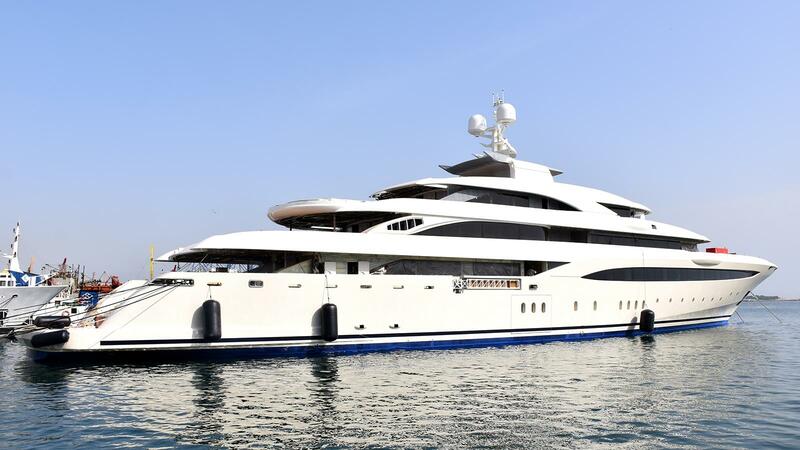 It has been confirmed that 85 metre steel-hulled superyacht O’Ptasia has been launched in Greece by Golden Yachts. Styled inside and out by Studio Vafiadis with naval architecture by N Hellas, O’Ptasia will now be offered for charter through Atalanta Golden Yachts. Her accommodation is comprised of 11 staterooms, including an upper-deck owner’s suite that measures 95 square metres and comes with a private study, walk-in wardrobe and en-suite bathroom. Two double cabins and a twin complete the layout on this level, while two doubles, two convertible cabins, two twins and a VIP suite on the main deck further add to the extensive hosting options. It has 18 crew cabins that ensure that every whim can be catered to, including a bridge-deck captain’s cabin. The central superyacht elevator provides quick access between all four decks, while the foredeck helipad allows guests to arrive in style. O’Ptasia has a spacious superyacht beach club. Power comes from a pair of 3,386hp Caterpillar 3516C engines for a top speed of 16 knots, while the built-in stabiliser system should ensure a smooth cruising experience, both underway and at anchor. O’Ptasia will become the flagship of the Golden Yachts fleet, as well as one of the top 200 largest superyachts in the world.